Consumer spending increase in the US was today's big economic story, with some viewing the increase as yet another sign of improving US economy. LA Times: - Consumer spending rose 0.8% in September, the third straight monthly gain and the biggest increase since February, the Commerce Department said Monday. Personal consumption expenditures increased $87.9 billion last month after increasing a revised $59.9 billion, or 0.5%, in August. Consumer spending has been up each month since coming in flat in June following a decrease of 0.2% the month before. September's figure came in above analyst expectations of an increase of 0.6%. "This means the fiscal cliff is not worrying consumers at this point like it is the business sector," said Chris Rupkey, chief financial economist for the Bank of Tokyo-Mitsubishi in New York, noting business investment spending was down in Friday's report on third-quarter economic growth. Perhaps. But this one deserves a slightly deeper look. Here are some reasons it may be a bit early to celebrate a revival in US consumer spending. The spending increase came at the expense of declining savings rate. Personal income grew by 0.4%, which means that the rest of the increase in spending had to come from declines in savings or expanding credit. We know that consumer credit remains flat except for growth in student loans (see discussion). 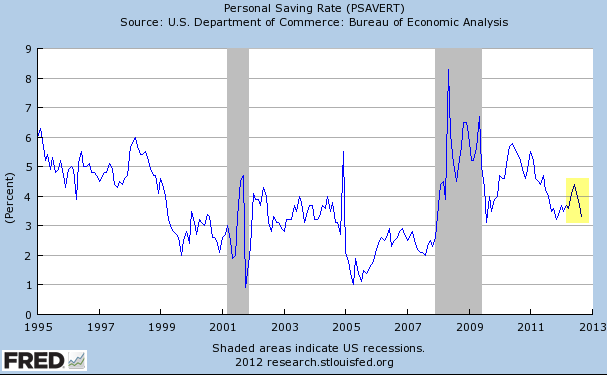 That leaves savings, which indeed declined in September (chart below). An argument could be made that in order to better understand this trend in spending, a more meaningful measure of consumer expenditures is the "chained" index (including taxes and inflation). In fact if one looks at the BEA page (here), that index is shown on the highlighted row below. It becomes a simple exercise to see where the recent consumer spending trend comes from. If one plots a trend line through the Real Personal Consumption Expenditures (chained index) ignoring the bubble years, the growth is precisely where it should be if we continued the trend from the 90s. And this chained index shows that spending grew at a more moderate rate (0.4%) than the headline number - certainly nothing out of the ordinary. Note that on chained basis, personal income growth in September was actually zero, meaning that the chained indices also imply that the consumer had to dip into savings. This indicates that even the trend in the chart above may not be sustainable unless real incomes grow or the consumer begins to borrow again. In particular with the lower savings rate, the consumer is now highly vulnerable to the shock of impending tax increases (or inflation). Reuters: - While personal income last month grew 0.4 percent, the most since March and a step-up from August's 0.1 percent gain, the amount of money at the disposal of households after inflation and taxes was flat. That meant households had to cut back on saving to fund purchases. The saving rate slipped to 3.3 percent last month, the lowest since November 2011, from 3.7 percent in August. "We have only seen two lower readings on the savings rate in the recovery, which suggests that the consumer has virtually no cushion to absorb the scheduled tax hikes at the beginning of 2013," said John Ryding, chief economist at RDQ Economics in New York.